If you want to access the web GUI of your Gradwell-supplied router (for example, to tweak some settings) then first you will need to know the IP address of your router. All Gradwell routers are supplied with a static IP address that does not change, you can find this in your control panel or welcome email. Alternatively, simply type in "what's my IP" into a search engine. N.B. on some router models by default the username box will be greyed out and pre-filled with "administrator". To change this field please click the change button. 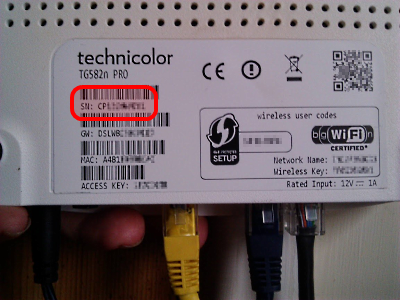 The serial code can be found on the bottom or rear of the router, as shown in the picture below. If you are using a Technicolor TG588n router you will first be taken to a dashboard. To sign in click the button in the top right corner.